Strange magics require strange sigils, and sometimes those sigils leave their mark on the arcanist’s mind. Sometimes the arcanist manifests the obsessive details of these sigils in drawings, in carvings, in tattoos, and in this case, in passages dug into stone. These passages are not level, they are the creations of a mind twisted by magic. They are angled, they climb over themselves, they loop and twist and enter in rooms that are hard to describe to the layman – or to any person who hasn’t spent time tortured and torn asunder in the Violet Hells. Within these chambers and passages, boundaries are thinner and access to the denizens of the Violet Hells is easier – as is their ability to affect this world. The only thing that actually makes sense about this whole construction is that there is no non-magical access to it – no stairs or doors enter these convoluted dungeons. The only way in and out is via teleportation with most arrivals from the world where it is ensconced arriving via the pool of thick teal mucus-like liquid in the southeastern chamber. 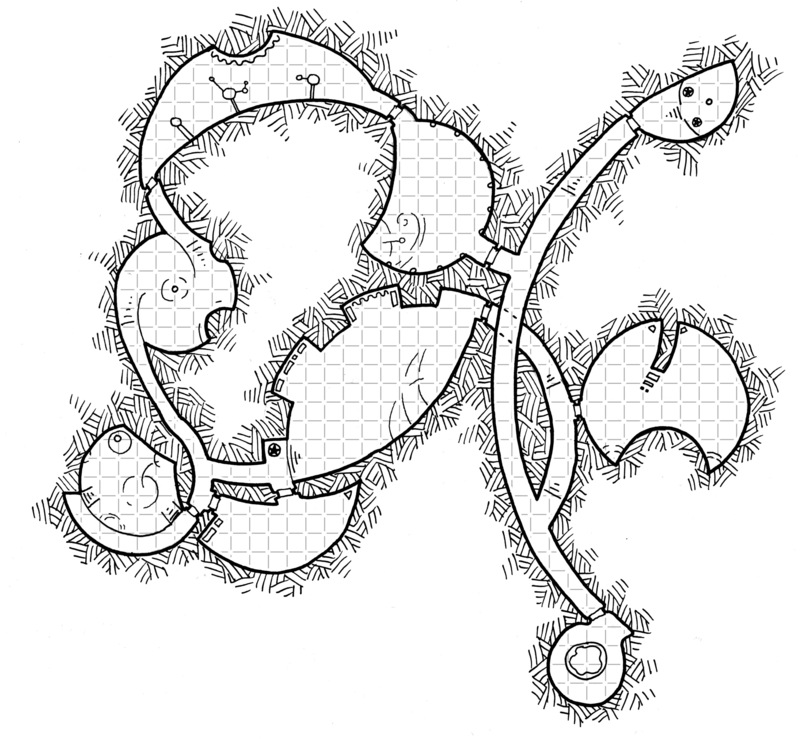 I’ve been scouting your maps to stock a hexcrawl game, and this make for a perfect weird wizard lair. I want to use this! That is awesome!